Rolling hills with views of Olympics and Cascades. Wooded park with picnic facilities, lake, stream, and pond. Wheelchair access to many holes. Front 9 technical - back nine opens up a bit. Well maintained and busy. 2011 redesign features large grippy tees and natural stone looking benches. On site concessions (food, smoothies and espresso) and pro shop. I-5; Michigan St. exit. Right on Michigan at light, 0.5 mile onto the 1st Ave bridge. Take 2nd exit onto Meyers Way/White Center. Up hill, follow signs to Olson Pl/White Center. At top of hill, left on 4th Ave SW, right on SW 108 St.Left on 10th Ave SW drive midway down and make left turn into parking lot. 1st tee close to parking lot, with #1 basket over small pond. 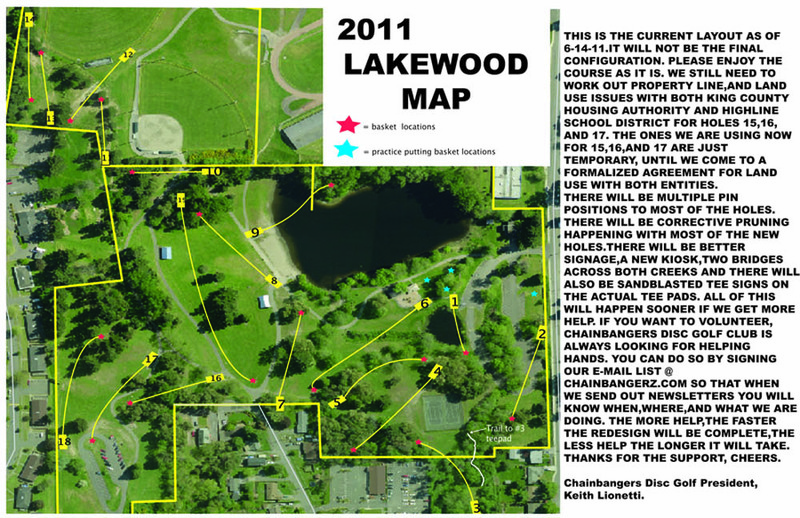 Usually maps and scorecards available at pro shop/concessions during business hours. First few holes are short but full course is outstanding. Well maintained. Hole 9 and 10 are tricky as goes over lake. It is a 3.5 or 4 rated course. Beautiful park. Disc golfers take good care of the course area. Elevation, great views. A few navigation challenges with the extra tee pads and some issues with transitions to the next tee. A bit open compared to White River - another very good course in the Seattle area. Best course I've played in Seattle. 18 unique holes with varying challenge.